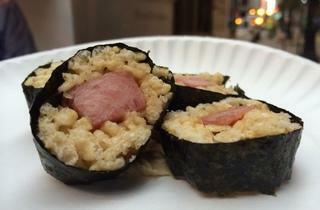 "This looks like something a preschooler would do," our co-worker said as he surveyed our plate of Frankenfood—tiny servings of Guinness Chocolate–Coated Pork Belly, a Bacon-Wrapped Hot Dog Eclair and Spam "Sushi"—which are available this week (for free!) at a food truck to promote a hideous new show on Spike TV. 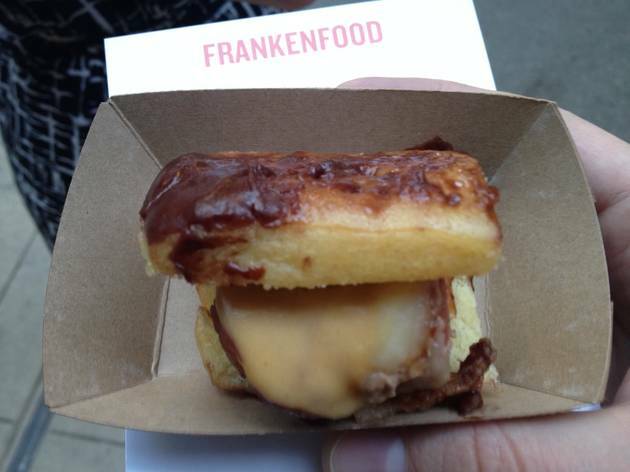 The show, which also goes by the name Frankenfood, debuts on June 22 at 10pm. Visit its website and you'll find this riveting description: "America is hungry for the next great food sensation"—we're not, I promise you. "Josh Capon eats his way across the country to find the best 'Frankenfood,' revolutionary creations that mix outrageous and unexpected ingredients in delicious and unique flavors." 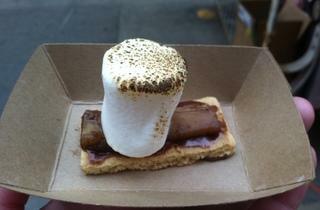 Trust us: You want to stay as far away from these "food sensations" as possible. 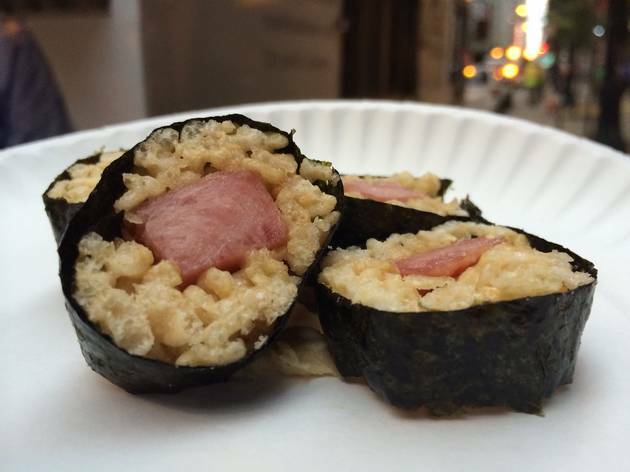 There's the Spam "sushi," which is a soggy mess of Rice Krispies Treats and seaweed wrapped around Spam, with plaintain puree glueing it to the plate. 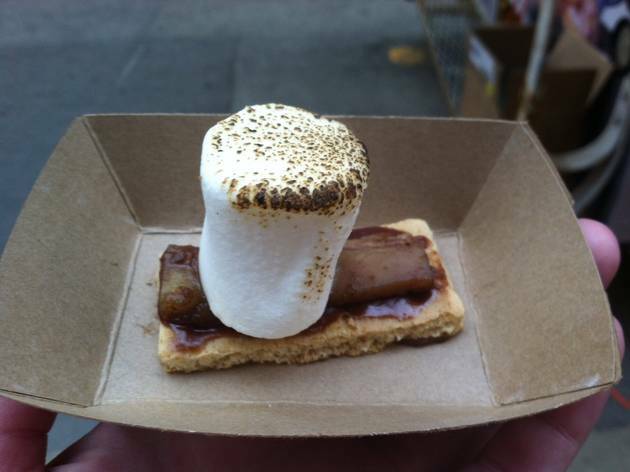 There's the pork belly, which is served atop a soggy (there's a theme here) graham cracker with a big campfire marshmallow and a disgusting Guinness-chocolate sauce. And there's the hot dog eclair, the best of the bunch (it omits the cream filling) but still grotesque, since it contains "Cheez-It puree," two words I never want to hear together again. We didn't try the Fruity Pebbles Chicken Tenders or the Fried Slim Jim Mac and Cheese Balls, because they made us tweet or Instagram a photo of the truck in order to get a free sample. And we don't hate ourselves enough to do that more than twice. 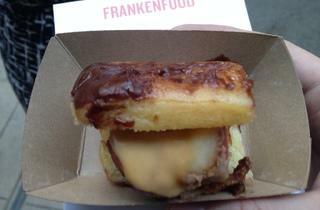 Are you going to brave the Frankenfood truck? Tell us what you get and share your photos on Instagram at @timeoutla.